In addition to all the other software components of the Interdimensional Wrecked System, Ms Pinky provides a toolbox of patches and code objects designed especially for DJ’s to use in the Max For Live graphical programming environment. With these special add-on components to Max For Live, DJ’s have the ability to apply low-latency turntable scratch manipulations to audio clips directly inside a Live session. And that’s only the beginning because users of Max For Live can create their own custom patches with Ms Pinky’s objects to do almost anything. For more information, click here. 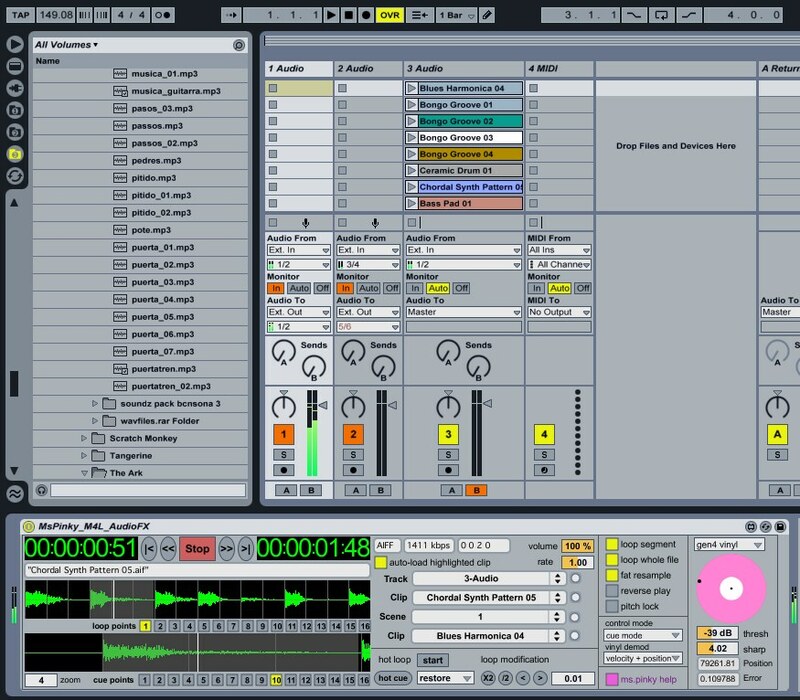 This image shows Ms Pinky’s Max For Live patch as it appears inside a typical Live session. This device can load any audio clip in the session, and allows the DJ to use a turntable to scratch that clip just as if the sound were recorded onto the surface of the vinyl. Up to 16 loop and cue points per clip can be set and triggered either using the mouse and keyboard, or on the fly using a MIDI device. The loop and cue points are saved and restored for use in subsequent sessions. But this patch is only the beginning. Press the “edit” button and Max For Live opens up the patch for you to start customizing as you wish. A special code object provided by Ms Pinky decodes the control signals coming from your turntables playing the Ms Pinky vinyl and produces nearly instantaneous measurements of vinyl velocity, direction of rotation, and position of the stylus within the groove. Other code objects display the audio clip’s waveform, its elapsed and remaining time, and a rotating disc representation of the vinyl. 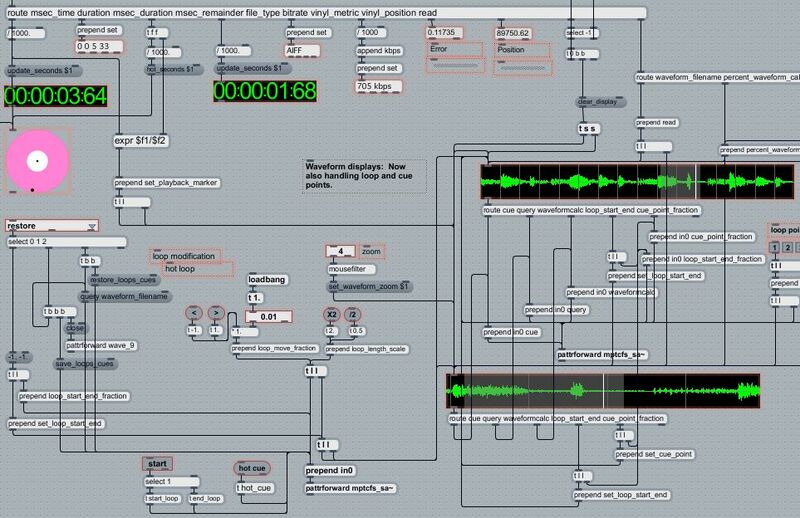 You are free to use these objects and this editable patch to create a totally unique scratch device for yourself using the tools of Max/MSP. Check out this video showing a custom patch created by Mastah Lee…. Ms. Pinky Revised from Mastah Lee on Vimeo.